A key point about our approach is the fact that we focus upon practical, scalable, service -oriented solutions that have a guaranteed return on investment. Put simply, our turnkey programs actually work and, once implemented, districts use them as a working foundation upon which they build their own state-of-the-art virtual academies and blended learning programs. Rather than offering a partial solution by relying solely upon a digital curriculum product or a technical delivery framework to carry instruction, we provide an inclusive suite of technology products and personalized support services that districts use to engage students in rigorous and engaging learning opportunities. 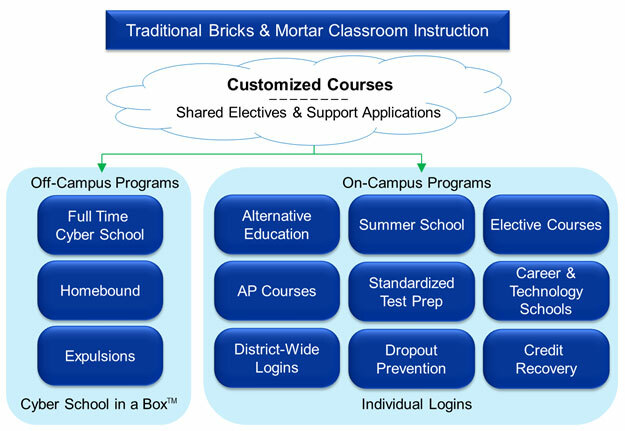 Many districts that work with VLN start with the turnkey Cyber School in a Box™ product and then expand their programs to include various types of blended learning programs. The key attribute that makes this expansion possible is the fact that VLN’s customized online lessons actually reflect the curriculum decisions made by teachers, administrators and school board members in any given school system. In a very practical sense, VLN offers rigorous and engaging online lessons that match the scope and the sequence of instruction presented in a district’s classrooms. Unlike other online learning options that rely almost exclusively on computer-graded multiple choice quizzes and tests (often presented repeatedly until students achieve a passing grade), each lesson presented in our courses includes a multiple choice quiz and several forms of written assignments (“artifacts”) that are submitted to our teachers and graded. Ultimately, this unique ability to deliver an authenticated, fully supported, online version of a district’s curriculum across multiple learning environments makes VLN the only viable district-based alternative for K-12 public schools when public school districts across America make the inevitable shift to a form of learning and teaching that embraces instructional technology.